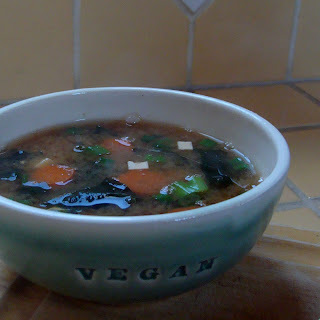 In a small/medium saucepan, combine water, sliced carrots, sliced green onions, mushroom, and wakame flakes. Bring to a boil and remove from heat. 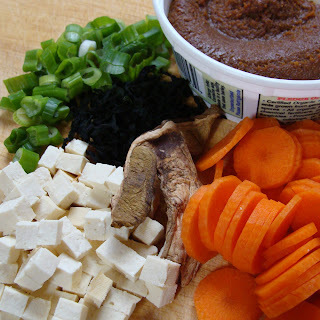 While you are waiting for the water to boil, combine ginger, miso, and a splash of water (maybe 1 tablespoon) in a small cup or bowl and mix until the miso is creamy/dissolved. After you remove the water/veggies from the heat, stir in the cubed tofu and the ginger/miso mixture. Spoon into two bowls and enjoy! The next option is for those times when you're feeling a bit peckish in between meals and want to have something healthy and warming to tide you over until lunch or dinner. Boil some water in a teakettle. While you wait for it to heat up, combine ginger, miso, and a splash of water (maybe 1-2 teaspoons) in a mug and mix until the miso is creamy/dissolved. Pour hot (almost boiling but not quite) water over the top to fill the mug.